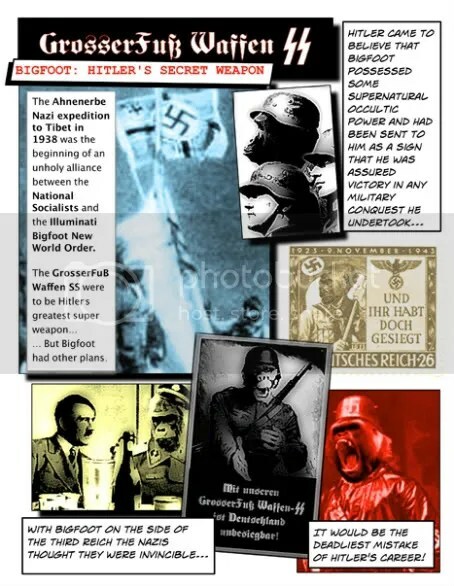 The secret history of the Illuminati Bigfoot New World Order’s Nazi past is finally revealed! Wow. It’s like Hellboy from an alternate reality in which the Nazis won the war. I’m curious what would’ve substituted for Hogans Heroes in that reality? Lancelot Link Secret Chimp, except with The Baron as the protag. This entry was posted on June 25, 2008 at 5:45 am and filed under comedy,comics,conspiracy theory,humor,illuminati,new world order. You can follow any responses to this entry through the RSS feed.